Balloon fillers and Helium regulators are featured with a standard rubber tilt valve, built-in ribbon cutter, and contents gauge. This balloon inflator is compatible with all standard helium cylinders with a hand tight CGA-580 fitting. Connecting it to gas cylinders is easy with the durable hand tight wheel. At Evergreen Midwest, you will find a complete line of balloon fillers, inflators that eases the job of filling many latex and mylar balloons. 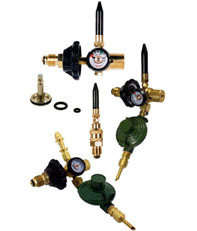 Some of these regulators have a wrench or hand-tight cylinder connection valves, with or without contents gauge. They may or may not have other additional options like E-Z tie hook, string cutters, or deluxe foil. Our balloon fillers are very useful accessories to fill uniformly sized balloons without any efforts while saving money, as it does not overfill the balloons. These ultimate balloon accessories are the choice of professionals, as they can be used extensively and in a rugged manner. Moreover, the ease of operation makes the helium regulators and balloon fillers user-friendly. They have strong and durable brass bodies and feature a piston-type mechanism.